Anton Chigurh (Javier Bardem): You may think you know what you're dealing with, but believe me, you don't. 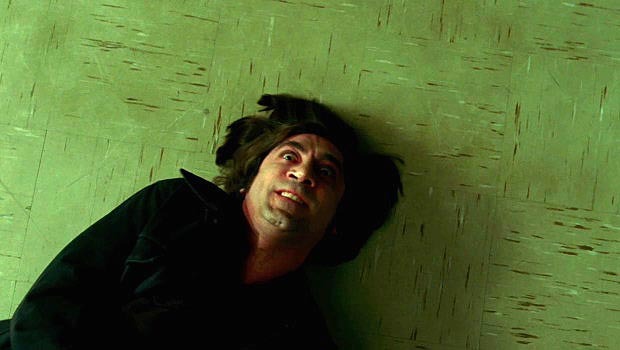 The New York Film Critics Circle gave Javier Bardem its 2007 Best Supporting Actor award for his role as Anton Chigurh ("shi-GUR") in Joel and Ethan Coen's "No Country For Old Men" (which was also named Best Picture). The funny thing is, so much of the discussion of the of the movie centers around Chigurh that you'd think he was was the lead. And critical reservations about "No Country" tend to focus on interpretations of Chigurh, and whether the critic accepts him as a character or a mythological presence or a haircut or some combination thereof. "No Country" traces the path of Sheriff Ed Tom Bell (Tommy Lee Jones), from his opening narration to his closing monologue, from his nostalgia about the "old times" and his fear of the violence in this modern world to his account of two dreams about his father. Llewelyn Moss (Josh Brolin), sets things in motion by taking the satchel of drug money, and Chigurh spends most of the film relentlessly tracking him down, while Ed Tom follows a trail of blood to catch up with them both. None of these characters is a conventional "lead." We never even see Moss or Ed Tom come face-to-face with Chigurh. He exists in the physical world, but his presence is strongest when it's felt by these other two characters, even though they don't share screen space with him. It's rare that a movie -- or a figure in the movie -- generates this kind of discussion and interest (see comments on the above post, where the interpretive debate continues). Chigurh has been described as a representation of Destiny, Death, the Devil, God (intriguing question: Is God a supporting actor? ), Greed, Capitalism, Chance, Evil, a ghost -- even (by the more literal-minded) a "serial killer." That last one is the only approach that makes no sense on the movie's own terms, for reasons I have described in some detail previously. Chigurh just doesn't work for some viewers -- as a character or a concept or a myth -- but I found him awesomely fascinating, as a physical presence as well as an abstraction. Who is that character in "No Country"? Or is there one? To some extent, Carla Jean (Kelly Macdonald) and Ellis (Barry Corbin) provide that function, but not until late in the film. I think Chigurh's most formidable adversary, the character who best sizes him up and refuses to be intimidated or to give the slightest ground, is the Desert Aire trailer park manager (Kathy Lamkin). Her principles are steadfast, she locks him in a stare-down, a contest of wills, and she will not budge: "Sir I ain't at liberty to give out no information about our residents.... Did you not hear me? We can't give out no information." Perhaps she's saved by the off-screen flush of a toilet, or perhaps Chigurh simply has to respect the force of her will. Carla Jean is the only other character who gets him to adjust his position. When she says, matter-of-factly, "I need to sit down," she takes the upper hand for a moment, and he offers a coin toss. But she refuses to accept his terms. (Reminds me of the original "Nightmare on Elm Street": refuse to cede power to your nightmare and it loses the ability to terrify you.) Carla Jean's fate is decided off-screen, too, but for the first time you feel that Chigurh is diminished by an encounter with his prey. In the next scene, he becomes the wounded dog, and slinks off into suburbia.